The actions of the Customers Service Professional should be constructive not destructive. His behaviour should make a customer feel that everything he does is aimed at providing extra benefits to the customer. Positive Customer Service is recommended for building a positive rapport with the customer. ‘No’ is one word that customers detest. They are allergic to phrases like “Not possible” and “ Can’t be done However this does not mean that every request of a customer must be answered with a resounding ‘yes’. Rather, it is the approach, the style and the content that needs to be constructive as opposed to destructive in nature. A positive attitude on the other hand is something that a customer loves. Phrases like “ Sure”, “Let’s explore the possibility or I have a suggestion that could benefit you are welcomed by customers. Instead of saying no or using the word problem try merging the two and what you get is the magical no problem try being a Customer Service Professional who responds with a no problem instead of being one who says no and problem separately. You will find it easier to woo and win a customer. Consider this travel agent who had a prospect that constantly changed his mind. Fortunately for him he realized early in the Brand Experience that the customer remained undecided basically because his schedule was dependent on factors beyond his control. The customer kept wavering and changing his itinerary but the travel agent was always positive in his attitude and constructive in his suggestions. It would have been easy under the circumstances to become cynical and negative but not once did the travel agent do that. The customer after changing his mind no less than seven times finally firmed up his plans and finalized his itinerary. He was so impressed with the travel agent demeanour that he become a lifelong customer himself transferred all his company’s business to this account and unhesitatingly recommended the agent to his friends. All because of his positive attitude and the hopeful Brand Experience. When a customer is in difficulities or the victim of a tragedy a Customer Service Professional who is Postive spreeds a little sunshine in an otherwise gloomy scenario. Customers are always appreciative of this. A customer service professional who is insensitive or callous to the problem on the other hand can invite disastrous results. A mother-to-be who went to a gynaec for a check-up would have been in for a shock if she had been told off the cuff that she had a miscarriage. Instead the gynaec who realized the problem suggested a second opinion after additional tests at a clinic across the street. The women innocently went for the additional tests and was tersely told that the child has been dead a few hours ago. Naturally this positive outlook of the doctor had an unbelievable effect on the young couple. Suddenly the world of their that had come crashing down a few minutes ago in the clinic across the street was full of hope and even had the prospect of joy. A positive attitude is worth more than just words. It is the harbinger of glad tidings. One of the most important duties of Customer service professional is to bring hope through positive and constructive behavior. My positive Customer Service Prescription will bring sunshine into customer’s life. It cuts through the gloom and kindles hope. 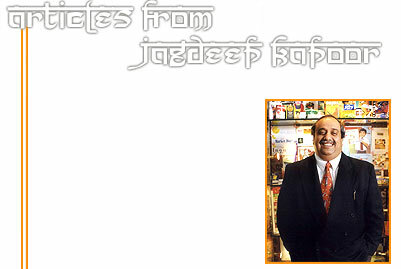 Copyright © 2005, All rights reserved with Jagdeep Kapoor – Managing Director, Samsika Marketing Consultants Pvt. Ltd.
No part of this document may be modified, reproduced, stored, deleted or introduced in any retrieval system or transmitted in any form or by any means (Electronic, Mechanical, Photocopying, Recording or Otherwise), without the prior written permission of the copyright owner of the document.